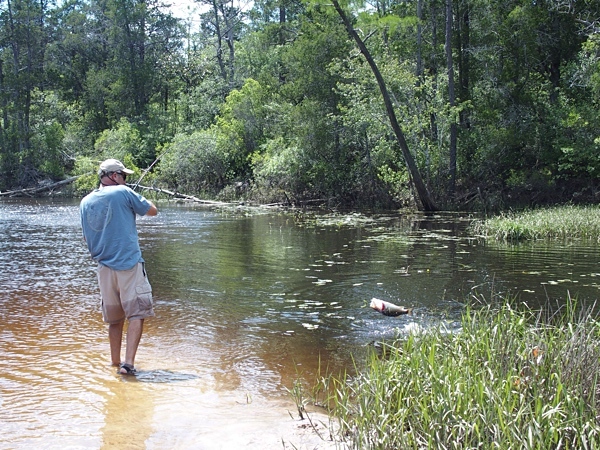 The Blackwater River is in the Panhandle, and is North of I-10 in the town of Holt Florida. It is located just NE of Milton. The park has a beach along the river for visitors to swim for fish, and I decided to wade since the current was not bad, and the bottom was a nice hard sand. I found a little cove as I walked south with some pads and grass in the water, a perfect spot for a bass I thought. I made a few cast and a terrific bite on the Zoom speed worm, but lost the fish in the pads! Ouch! I kept fishing the area with the speed worm, but did not have any more bites, so I went with the Fluke. On the first cast with the Fluke in the exact area where I had the other bite, I hooked a good one! 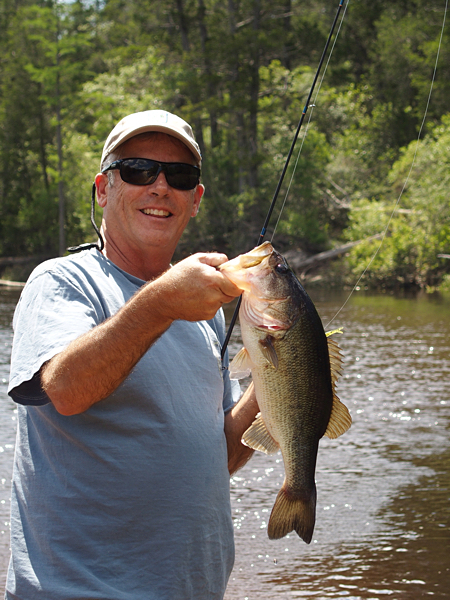 Sharon got a great shot of it fighting, and as you can see a nice 4 pounder! I moved to the other side and fished a bush that produced an eddy, and as I was taking the Fluke out of the water after it got hung on a tree branch, I bass couldn’t stand it, and grabbed the Fluke. A small 13″ size, which was fun to catch in the current. This entry was posted in Uncategorized on May 15, 2015 by shurstrike.